Bishop Daniel Thomas helped dedicate the newly remodeled St. Rose Catholic Church and school. Part of the building addition at St. Rose includes a new Parish Center. 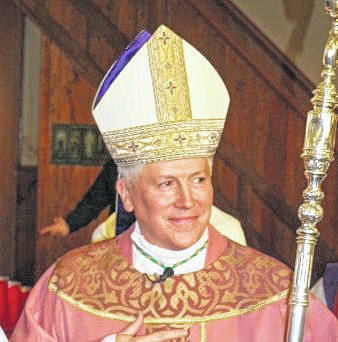 LIMA — A project to restore St. Rose Catholic Church and its school addition was completed Saturday with a Mass at the church featuring Toledo Archdiocese Bishop Daniel Thomas. 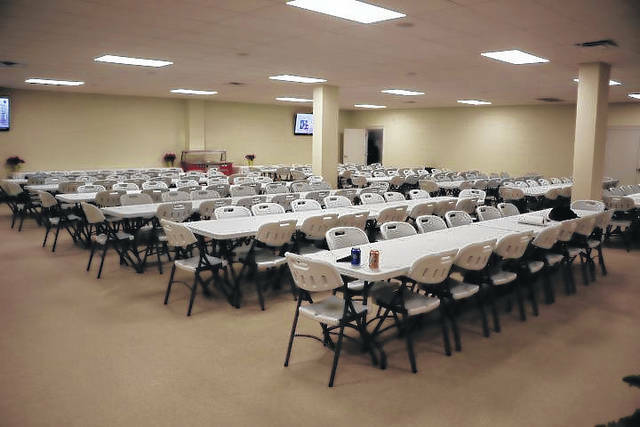 In 2010, church officials recognized the need to make various improvements. In all, over $2 million would be needed for the project, which included a new school gym, additional classrooms and a parish center. Several improvements were made inside the church as well. 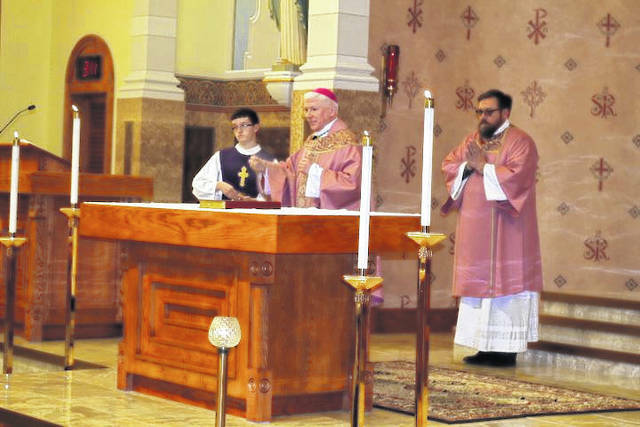 “We rejoice with great joy to dedicate and to bless a new ambo, a new ambry and a new baptismal font,” Bishop Thomas told parishioners during Mass. The church restoration project was designed and completed by Evergreen Studios of New York, which included exposing the five stained glass windows near the altar that were enclosed in 1956. Local craftsman Everett Birkemeier designed the ambo (elevated pulpit), baptismal font, ambry (oil storage niche) and the reredos (decoration behind the altar) to complement the altar. New flooring was installed in the sanctuary, new carpet in the aisles, and the sacristy (robe storage room) was renovated. Because of local people volunteering to help, they were able to save over $100,000. “There was a lot of people involved in it,” said James Bourk, finance chairman at the church. As part of the project, the old high school building was torn down. “The old was obsolete. It was a real problem for us, heating-wise and a lot of things, so it had to go and this was the way to finish it up by building an extension on the old school,” Bourk said. “We’re very excited, for our parish and for the school and our school families,” said Donna Judy, principal at St. Rose Catholic School. “There will be more rooms. The second floor is going to have three extra classrooms up there so we’ll have more room for students. It will help the gymnasium. We’re all going to be attached to one building and so being able to have gym class in there … the parish center, we’ve never had that before. That will hold things from the parish, funeral luncheons, wedding receptions, we could have meetings for our teachers with our students and can all fit in one space,” said Judy. “We’re very blessed by the Lima Catholic community. Everyone contributed to our project,” she said.